Selling one’s home can be a complicated and emotional process. When selling your home there are no guarantees that a buyer will simply walk through the front door. In many cases you may have to bring your home to the buyer. 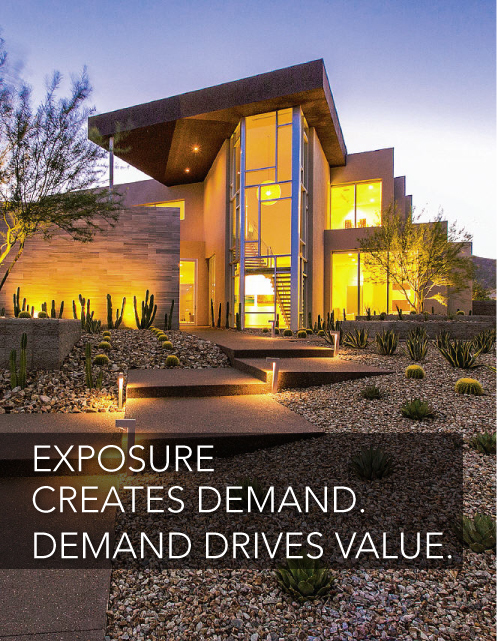 Berkshire Hathaway HomeServices Nevada Properties' effective marketing techniques will help ensure that your property receives maximum exposure to attract a ready, willing and able buyer. No company sells more real estate in Nevada than Berkshire Hathaway HomeServices Nevada Properties. The appearance of your home, a buyer’s first impressions, and other considerations can also affect the sale of your home. Be sure to explore tips for increasing your home’s value. Have you considered that home prices in your neighborhood and the value of your property are also factors used for pricing your home? The Las Vegas Real Estate Market is a quickly changing environment that you need a professional to navigate with you. When you work with Berkshire Hathaway HomeServices Nevada Properties, you can count on a specialist who can answer your questions, apply in-depth knowledge of current market conditions, and access extensive resources that can expedite the sale of your home. Let’s walk through the selling steps in order of priority. Start getting information on market conditions. The quickest and easiest way to do this is a no cost, free comparative market analysis of your home. Get one now. Pick an agent to help you. If you are looking for the best agents in Southern Nevada, then you have come to the right place. Although Berkshire Hathaway HomeServices Nevada Properties has many assets to assist you with, our best asset is our people. Berkshire Hathaway HomeServices Nevada Properties agents generate more value for their clients than any other agents in the local marketplace with the highest average selling price of any company in the Las Vegas area. Your Agent will provide you with expert advice regarding what steps need to be taken to maximize the sales potential for your property. Set a sales price based on extensive market research and knowledge of selling conditions. Your Berkshire Hathaway HomeServices Nevada Properties Realty agent will provide you with maximum exposure for your property. This includes distribution of your home to over 12,000 real estate agents in the area and placement on both local and national websites as well as a variety of local print publications. Berkshire Hathaway HomeServices Nevada Properties is also the exclusive provider of listings to Yahoo for this local area. Additionally Berkshire Hathaway HomeServices Nevada Properties prints and distributes the largest and most distributed local Real Estate Magazine in Nevada, that all our listings can be viewed in free of charge. Your agent will work hard to make sure that the right buyer with the best price purchases your home in the shortest time possible. Our worry free closing services are designed to make the selling and closing process simple from transaction to closing. CONTACT US NOW FOR A FREE ‘NO OBLIGATION’ CONSULTATION. We employ only full time agents who have significant experience in the local real estate market. Our agents are known for their reputation and professionalism in the marketplace. All agents have extensive ethical training and are supervised by full time managers who do not buy or sell. Our agents have an unparalleled knowledge of the buying and selling process which leads to a worry free transaction. Berkshire Hathaway HomeServices Nevada Properties Agents generate on average more Sales Price / Value per transaction than any other agent. Our agents have a superior knowledge of the local real estate marketplace. Berkshire Hathaway HomeServices Nevada Properties has been around Las Vegas for more then 30 years. All of our agents and staff are extremely responsive to our customer’s questions and needs. Our offices are open and staffed 7 days a week. If you have a question, you can be assured that we will get back to you in the prompt and professional manner you expect and deserve. Talk to one of our agents by email or phone and receive a free consultation on your real estate needs. Our agent experts have access to data on over 25,000 properties and can provide you with up-to-the-minute advice on market conditions. Plus, our years of experience in the industry and our extensive relationships help us to give you the best expertise in the market area.